The New York Yankees’ injury-riddled season continues to spiral out of control, as the Bronx Bombers received even more bad news. 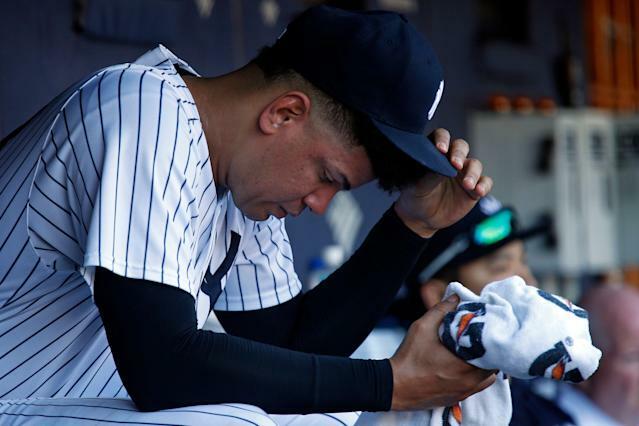 Four-time All-Star reliever Dellin Betances experienced a setback after throwing a simulated game on Thursday and will be out until at least June. General manager Brian Cashman spoke to the media on Friday and confirmed that Betances has a bone spur in his throwing shoulder. He will receive a cortisone shot on Saturday to ease the pain and not do any baseball activities for three weeks, which puts his timetable to return at six to seven weeks at best. Betances has apparently had the bone spur since the Yankees drafted him in 2006, although this is the first time it has bothered him. How will the Yankees deal without Betances? When healthy, Betances has been one of the most dominant relievers in the league. Betances has struck out 40.3 percent of the batters he’s faced since 2014, which ranks only behind teammate Aroldis Chapman and free agent Craig Kimbrel. Meanwhile, his 11.3 WAR is in a virtual tie for first during that stretch, and his 2.24 ERA ranks fifth. However, the Yankees have faired decently without him so far this season. With the caveat that it’s only been 45 1/3 innings, the Yankees bullpen is third in the majors with a 1.0 WAR and 3.97 ERA ranks 11th. The Yankees have perhaps the deepest bullpen in the league with Chapman, newly sign Adam Ottavino, Chad Green and Zack Britton, among others. However, that depth may only last so long, and the Yankees would like their big set-up man back soon. Friday already got off to a bad start for the Yankees when catcher Gary Sánchez landed on the 10-day injured list with a left calf strain, but the bad news hasn’t stopped. The team has been without ace Luis Severino since the start of the year with a rotator cuff injury, but now he’s out for at least another six weeks because of a Grade 2 lat strain. Even more bizarrely, the team doesn’t know how Severino suffered the latest setback. The Yankees have an outlandish list of injured players at this point; all the injured players were expected to produce 22.1 WAR this season, which is more than five different teams were projected to accumulate in total. The good news is the Bombers are still in second place in the AL East with more than a 90 percent chance at making the playoffs.